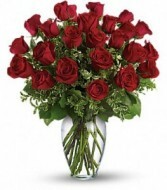 The classic romance of red roses can say so many things, from "I love you!" to "I'm sorry." Stunning in its simplicity, this elegant arrangement of deep red roses, rich green salal and delicate pitta negra makes quite an impression. 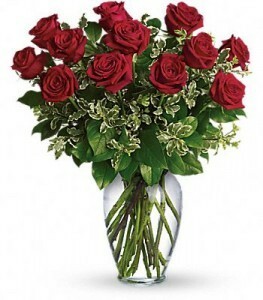 Two dozen red roses are arranged with salal and pitta negra in a spring garden vase. This Rose Bouquet employs a soft assortment of roses to create a sweet and stunning arrangement. 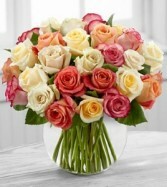 Cream, white, orange and pink roses are simply brought together in a clear glass vase.